Well I'll be damned, if this isn't everything you want from a rakdos deck on one card. 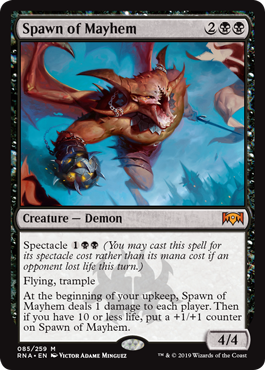 Being able to trigger spectacle for subsequent Spawns and other Rakdos threats is legit, and 3 mana 4/4 flying, trample demons seem pretty good. Guild flavor is certainly overflowing with this one. This is going to be one f-ing annoying card to see your opponent cast on the draw. Besides that, it's a well-designed card on a body that is VERY decent on its own. It also consistently drains the opponent away, amplifying the pressure that you're hopefully applying with your earlier plays. The real question is what configuration of Rakdos will be the best? It's an excellent creature, for sure, but how does he smell without a nose?